2006 Ural Patrol. Picture credits - Ural. Submit more pictures. Want to get dirty� Looking for a bike that can travel those snow-covered roads like no other� Look no further. In a class by itself, the Patrol is the only motorcycle in the world manufactured with an on-demand sidecar drive. This street legal ATV gives you the ability to switch between single-wheel drive and the unbelievable traction of dual-wheel drive with the flip of a lever! Price as new (MSRP): US$ 8595. Prices depend on country, taxes, accessories, etc. Comments: With sidecar. Gearbox with reverse. Engageable sidecar drive shaft. Recommended max speed 105 km/h (65 mph). Ask questions Join the 06 Ural Patrol discussion group or the general Ural discussion group. Bikez.biz has an efficient motorcycle classifieds. Ads are free. Click here to sell a used 2006 Ural Patrol or advertise any other MC for sale. 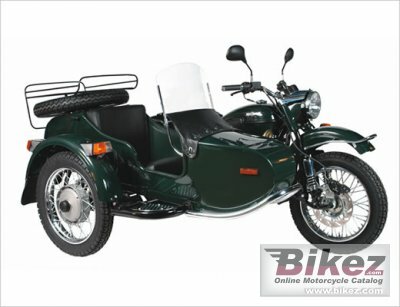 You can list all 2006 Ural Patrol available and also sign up for e-mail notification when such bikes are advertised in the future. Bikez has a high number of users looking for used bikes. Before you buy this bike, you should view the list of related motorbikes Compare technical specs. Look at photos. And check out the rating of the bike's engine performance, repair costs, etc.